Futuristic Visions of Yesterday is an introduction to some of the drawings as well as fashion, interior and object designs that pertain to a futuristic aesthetic and have been rediscovered in the BIAD School of Art collection. Since the 19th century we have witnessed the rise of visual representations that are commonly seen as ‘futuristic’. The way the future was imagined in previous decades can be an important source of knowledge about the past. The guide starts in the 1930s and goes through the 1950s presenting works that can be linked with Futurism, the art movement. It goes further to the 1960s and 1970s when interest in the future was characteristic to the Cold War era (1945-70) and the future gained political connotations due to the space race. The Cold War had a huge impact on popular culture and the way of thinking about the future on both sides of the Iron Curtain. In other words, the sixties was the decade when artists and designers were highly influenced by space exploration and indeed most of the ‘futuristic’ designs found in the Archives are from this period of time. Another radical vision of architecture is represented by a monochrome painting of a modernist streetscape with GO and HALT signs. The painting is characterised by geometrical, simple forms, strong diagonals and interlocking forms favoured by Constructivism. A combination of widening letters and shapes resembles Constructivist posters, with its directness of messages. The painting was prepared by John D. Mc Cann, one of the students of influential B.P. Arnold, who taught industrial Design and photography in the School until the early 1960s. His influence and style is present in many other works prepared by various students (e.g. Monochrome painting of detail from industrial machinery SA/AT/16/34/25; Monochrome painting of a flight of stairs SA/AT/16/34/29). 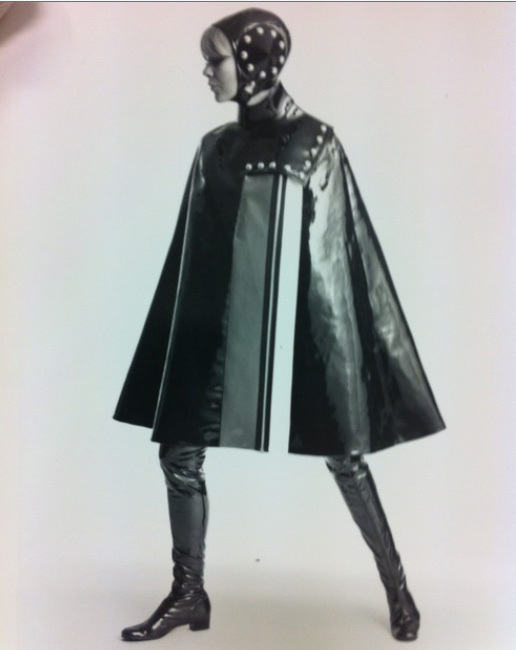 This photograph of a young woman in a PVC cape and go-go boots is one of the examples of using synthetic materials typical for the 1960s. The Space Race introduced many technological innovations and material developments that could be used in everyday life. Designers started to experiment with a variety of materials like plastic, metal and leather, as well as with shapes. Despite a remarkable optimism and belief in a bright future, the fashions of the 1960's disclose a concern to protect the wearer, possibly against a nuclear attack. Therefore helmet-like headgear and military plating are present in this design. 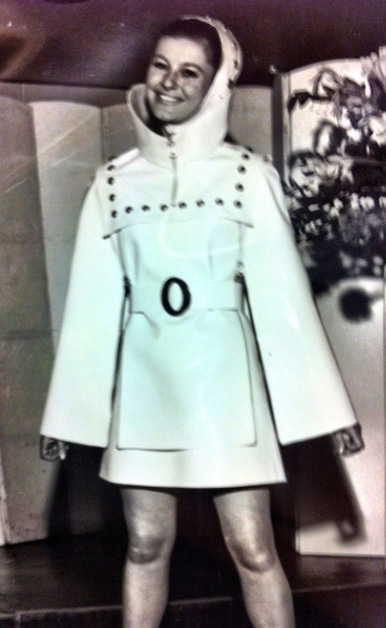 This photograph of a young woman in a short PVC raincoat with a hood, wide belt, metallic plating and ankle - length boots represents the typical Space Age ‘look’. PVC, the type of plastic used to produce shower curtains and raincoats, in the 1960s started to be used in high fashion. The design demonstrates concern to armour the body through headwear and metal breastplates. The photograph above shows a lady wearing a knee-length coat with a high sculptural metallic collar and a pointed hat, which can be seen as evidence of the 1960s interest in the juxtaposition of soft skin and hard metal. It demonstrates a desire to make something beyond fashion, towards architecture or sculpture. 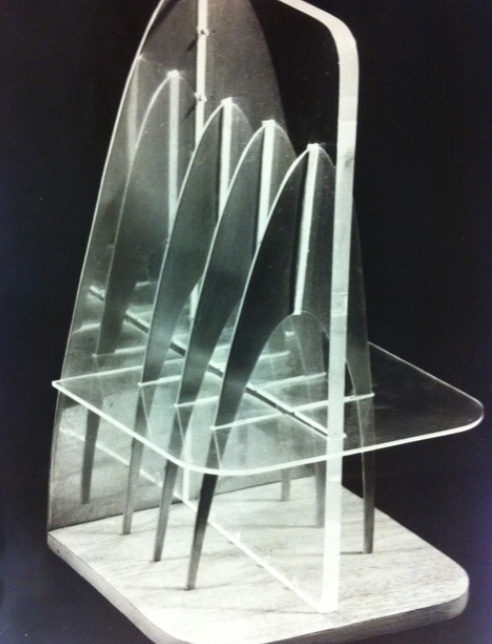 This spaceship-like object, in fact probably a toast rack, was created by one of the industrial design students Roy Appleby. This design is a perfect example of a Space- Age interior, with vibrant colours: bright red, red-violet, mustard yellow, black and white. The shapes have become more organic and graphic. In this design elongated chairs, and archways, contrast with the circular ceiling panels. New materials like plastic, fibreglass and Perspex started to be popular in manufacturing furniture in the 1960s. In the design above, fibreglass is proposed to be used to produce chairs, tables, lamps and even wall panels. It was prepared by G.L. Evans, a 20 year-old student of Birmingham College of Art & Design, for an Industrial Design Bursary Competition organised by the Royal Society of Artists. The drawings show the evolution of designs for fibreglass formed furniture. Almost everything is proposed to be made from fibreglass in this design: from chairs, through table, lamp, to walls. Fibreglass, originally used in the production of radars, became a popular material for everyday design in the 1960s. The chair resembles the 1960s classic Ovalia Egg Chair designed by Henrik Thor-Larsen and the Eero Aarino Ball Chair which were also made from fibreglass, painted white with rotating foot, contrasting cushions and the back. This guide provides an introduction to the Birmingham City University Art and Design Archives collections highlighting the number of sources waiting to be discovered and used in art and curatorial practices, as well as placing artworks in a wider artistic and historical context. The guide aims to encourage students to discover more. It may also be treated as an example of a curatorial investigation leading to the formulation of topics for potential exhibition. 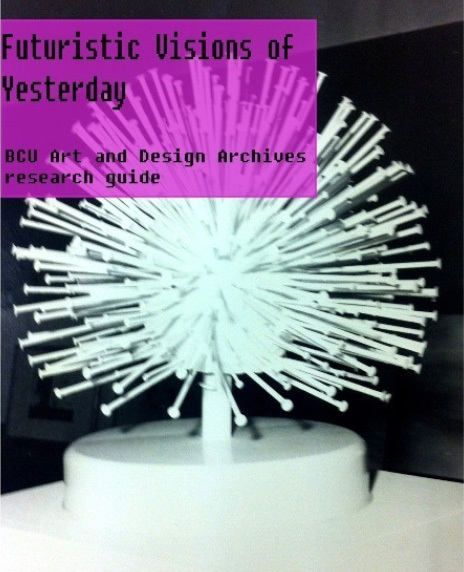 Futuristic Visions of Yesterday is a guide, which presents findings from a three-month research period in the archives undertaken by Roma Piotrowska, a Contemporary Curatorial Practice student. This project took place in 2012 as part of the Student Academic Partner scheme. During this period Roma browsed through a section of the eleven different archives and collections within the Archive, looking for interesting topics that she could potentially use to curate an exhibition. Her research has been narrowed down to artworks made between the beginning of the 20th century and the 1980s. Finally she has distinguished a theme Futuristic Visions of Yesterday that is repeatedly visible in one of the collections – BIAD School of Art collection. Written by Roma Piotrowska (2012), edited by Sian Vaughan (2013).